Whether you want to catch tulips at the peak of bloom in the Netherlands, see the sun glisten off gold onion domes in Russia, or experience an oxcart ride along a country road in Cambodia, AmaWaterways will take you there in splendid style and luxury. Hideaways Aficionado Club members receive a welcome aboard amenity and a one-year membership extension when booking with Hideaways Travel Services. Cast your cares ashore and settle into your premium stateroom for a waterfront window on the world's greatest rivers. If the early conquerors of Europe had only treated themselves to such an inspired view, they might have been in a more magnanimous frame of mind when they stormed the local castles. You, however, will be feeling totally de-stressed and sublimely pampered as you embark on complimentary shore excursions—presented as "Gentle Walker" or "Active Walker" tours—to explore intriguing castles, abbeys, and cathedrals. If you prefer the freedom of following your own schedule, grab a bicycle or two from the ship?s complimentary fleet and meander along riverside bike paths, stopping for lunch and a chat with the locals as you please. 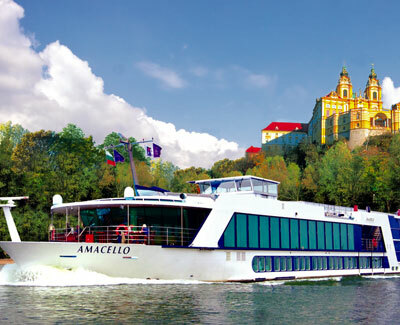 With 12 custom-designed river vessels immersed in the local color of Europe, Russia, and the Mekong, AmaWaterways takes you deep into the authentic experience of each destination with a level of luxury usually reserved for ocean-going ships. Its floor-to-ceiling French balconies bring the outdoors inside, while the full step-out balconies on its newer ships entice you to sit outside for a breeze-in-your-face view of the passing scenery. Catering to no more than 164 guests means that a friendly and unobtrusive staff will attend to your every wish, whether its another glass of bubbly during your European cruise's champagne breakfast or a late-night snack after the evening's specialty entertainment. Feeling in need of a massage? Then take advantage of the full-service spa on ships cruising through Vietnam and Cambodia. Need to stay in touch with the work-a-day world? No problem! Complimentary high-speed Internet access is available in every stateroom. While on board, you'll also savor delicious local dishes, enjoy free-flowing wine and beer, and have the chance to dine at your ship?s intimate Chef's Table. Who says conquering the great waterways of the world has to be barbaric?